OMG guys, I got a happy news to share with you guys so last month Wishtrend company contacted me and said that they wanted to send me products to try out and I was so stoked upon seeing the message. 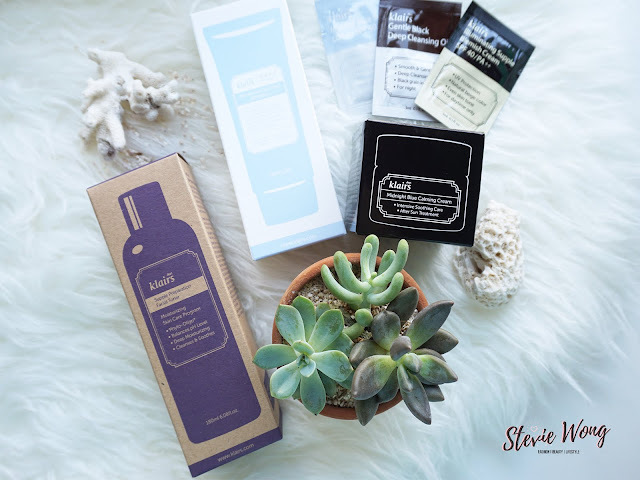 Literally jumping in joy I agreed to accept their offer and today I'm finally sharing my personal thoughts about Klairs products. Being a Korean Beauty (Skincare and Makeup) fan I've been eyeing on Klairs products since I've heard/ read lots of positive review about them. One of the products that I've been curious is Klairs Supple Preparation Facial Toner, cause my dear friend told me that this product does wonders to her skin. Now you'll find out how I think about the product after trying it on this post. 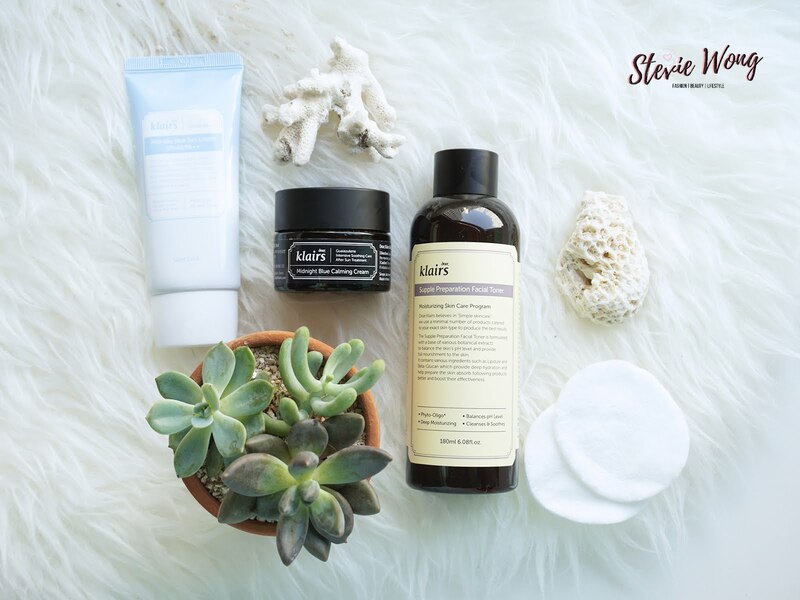 In this post I'll share my review about three products that Wishtrend sent me: [KLAIRS] Supple Preparation Facial Toner, [KLAIRS] Midnight Blue Calming Cream, and [KLAIRS] Mid-day Blue Sun Lotion SPF 40/PA++. This was the first product I wanted to try from Klairs. It has been a bestselling and Best Awarded two years straight. Definitely a product worth all the love its receiving, now I can totally relate to it! This product comes in a very lightweight and gentle formula that is meant to balance pH level, calming skin, enhance hydration and non irritant. It helps to hydrate and rejuvenate tired skin. You know most of the time when it come to skin problem usually the main cause is dehydration, when the skin is dehydrated, your skin will start looking dull and tired. The reason I love this toner is it smells so soothing, usually I hated scented product but this product smell just right. Not only its scent is soothing but the product also felt so good on the skin. my skin felt smooth and supple every morning I woke up after using it. I would usually use it tone my face every morning and evening after cleansing my face but usually in the morning I would just soak the cotton pad with the product and swipe it all over my skin while at night I like to pour the product on my palm and massage it into my skin just to give my skin a little treat. I feel that by massaging the product into the skin and padding the product into it it helps the product to absorb even better on my skin. However during the day time I would usually opt for the simple step and just finish skin care quickly. Even though I noticed that this product contains oil but apparently I've learnt and break that believe of mine that products that contain oil will break me out is wrong cause this one has been doing a great job in keeping my skin hydrated. Midnight Blue Calming Cream from the name itself it has already told you its blue. So never have I used anything this is blue before but the blue color comes from the key ingredient Guaiazulene. This cream is mean to soothe irritated skin and it is a multi purpose cream which you can used on different occasion when your skin is irritated such as after being exposed under the sun for a very long time, post shaving, after intensive skin care/ treatment, After pore care (e.g. : after poking your pimples, or extracting blackheads). This cream will help to soothe redness and inflamed skin like a magic cream. Are you one of those you can't resist poking and popping on your active acne? Sometimes bursting them help to fasten the healing process of the pimple but most of the time it is painful and usually after popping them your skin would look red due to inflammation but now you got this cream that will soothe your skin. P.s. popping your pimple is still not a recommended action, if you're lucky your pimple might heal quicker but if you did it wrong you're risking of causing more inflammation on your skin. This cream is designed more as a spot treatment cream where you apply small amount on irritated skin and not to the whole face as moisturizer because it doesn't do much as a moisturizer. It is also recommended to be used during nighttime when your skin will regenerate and this product will help skin regeneration and protect your skin barriaersby creating a protective layer on the skin. [KLAIRS] Mid-day Blue Sun Lotion SPF 40/PA++. This is the renewed version of the sun screen, It has a blue-ish hint of color to the product. This blue-ish color is due to main ingredients Guaiazulene which is naturally blue in characteristic. It gives skin with redness some beautifying effect by evening out the skin tone and making the skin look more clear. Even though its blue it doesn't look blue and pretty much blend in naturally into our own skin color however it does help to tackle redness and make it looks more calm. It is suitable for all skin types and contains 50 ml. It cost 20 USD which is quite affordable for a sunscreen as usual sunscreen cost pretty much the same. When you're active under the sun it is recommended to re apply after every 2 hours. Use it as the last step of your skin care regime and before going out to the sun. Wouldn't want to go out under the sun without sun screen ! All three Klairs products I've tried are very gentle and they also felt very light and gentle on the skin. Like usual when I try a new product especially skin care I would definitely give my skin a break like a day off without any products on except moisturizer before starting the new skin care products. I've done this for quite a while now and I felt by doing so I can really avoid my skin from being irritated or shock to the new product, cause I kind of have a sensitive skin so I need to take careful measure not to upset my skin. I started using this product early this month and started using it again Yesterday after stopping for a good one week and I realized my skin has not been reacting negatively towards it. Let me share my experience with you when I first tried them out early this month. First my skin has been breaking out a bit and I've been hesitant to try out new skin cares but when Klairs came I was so eager to try out the Supple Preparation Facial Treatment because a good friend of mine has told me that its very good for acne or you know when you got that tingling sensation of an acne coming out. She said that just apply it on top of it and the next day it'll be gone. Trusting her and putting my faith on Klairs I decided to ditch off my usual skincare and be committed to try out this whole skincare. Long story short after trying out the toner it really felt good on my skin leaving my skin feeling so supple and smooth the next day I woke up. I can also see it calming down the redness on my skin. Following up with the Midnight Blue Calming Cream just make my skin even more calm. Even though for my active pimples I still use acne spot treatment but the Blue cream really soothe my troubled irritated skin. I would usually tone my face with the Supple Preparation Facial toner then continue with my usual moisturizer then I would apply a thin layer of the Midnight Blue Calming Cream on the trouble area such as those redness after my pimple burst. By the next day that area would no longer be red and my skin will look a lot calmer. As for the sun cream they felt light and not greasy on my skin and it even give a color correcting effect on the skin giving it a sheer coverage like still your skin without makeup base but a more even out version of it. However for the Mid-day Blue Sun Lotion (Sun screen) I've not used it religiously because I rarely go outside and I'm the person you would rarely layer sun screen underneath my makeup if I'm not going outdoor because basically most of my base makeup already have SPF so I wouldn't put in any additional sun cream if I'm staying indoor. Therefore by now you must have know which are my favorites! Back again that no skin care does magic and you should enjoy the journey/ process, I didn't experience any breaking out after trying out these products but I still have my acnes but these products just tend to calm the skin so my trouble skin wouldn't look all flared up and red. Enjoy the healing process and always opt for a gentle approach. For more information regarding Wishtrend and Klairs other products kindly check out Wishtrend. Hope you find this post useful for those of you who've been wondering about Klairs product. Once again thank you Wishtrend :) 🖤 P.s. It's just so blissful to get collaboration offers from abroad, it just felt so good when someone recognized your work. Cheers to many more collaborations with Wishtrend and other brands too. Thank you for noticing my humble, little and growing blog.